Assembling a band is quite a challenge but if you’re going to do it, do it right is the message from Derbyshire lads Cottage Bluegrass Boys as they left Bonsall’s Barley Mow begging for more. Opening with Drinking Dark Whiskey and Little Ole Wine Drinker this talent lot hit the ground running with very little banter or between song gaps, something that always grabs my attention as it speaks volumes about their musical ability. And considering they’ve only done about twenty gigs they do have ample songs to play with and although many were unfamiliar, I could still feel the groove of the tunes which is something many bands forget. A song has to have groove. With more foot-tappers like Pushing On, Sunset Boulevard, South Side Of Heaven they mixed and matched vocal duties thus giving their performance extra spice, especially noticeable on the first set closer My Church, which saw most of the band singing and part-harmonising. This is something of a strength that the lads are planning to develop more. 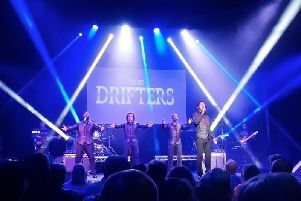 After the break more stuff followed as Mark Swift on banjo, Chris Goodall on a new-looking double bass since I saw them last, Gary Griffiths on guitar, Pete O’Halloran on the beat box and Antoine Bowers adding harmonica and vocals played another cluster of foot-tappers. Getting well-rehearsed has certainly paid dividends for Cottage Bluegrass as playing over a twenty five song set takes work, even for the young pups on the block. For me the evening was a great success, especially knowing several band members but not knowing they could even play, let alone sing, provided the cakes icing. They all knocked out some great songs and can more than hold their own when it comes to the live arena.